You’ve been running full tilt since your alarm jolted you out of bed. Virtually nothing has gone as planned and you’ve felt like you were a half hour behind all day long. If you’ve had one of those days, the last thing you want to think about it how to get dinner on the table for your family. Those kinds of days are the ones that leave me reaching for the takeout menus. An hour or so later, I’m usually regretting that decision. Needless to say, I’ve been on a quest for a family-friendly solution that’s not one of our old standbys, that will satisfy my family, and is FAST. Well, I’ve found it, and I’m hooked. 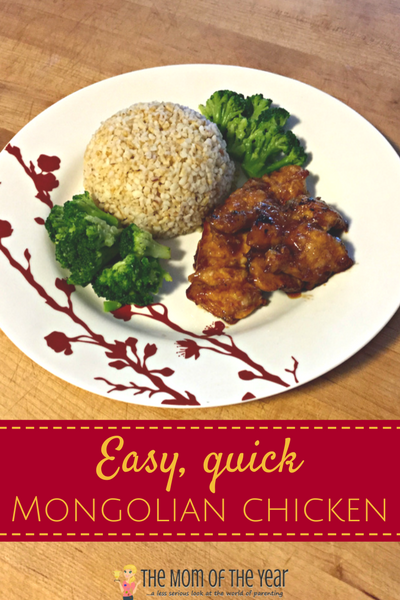 This Mongolian Chicken takeout fake out hits all of the right notes; tasty, quick, and wholesome! You’re thinking…wait! My family eats dairy or gluten free, so this won’t work for us. Happy to report, that this is an easy-to-make dish that satisfies both of those requirements. 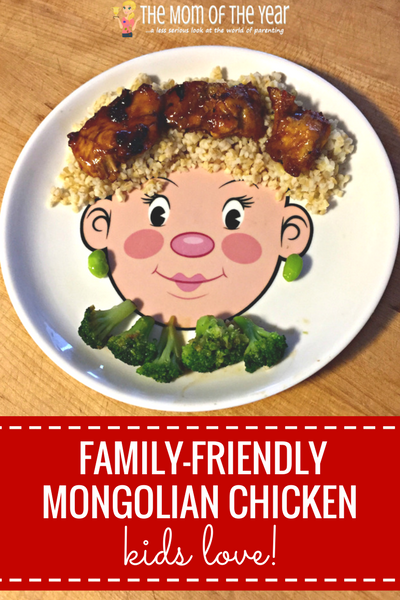 San-J’s Mongolian Sauce contains simple and flavorful ingredients and makes this family dinner come together in a snap. What makes this sauce stand out from the others on the grocery store shelves? San-J’s Mongolian Sauce starts with their amazing Tamari Soy Sauce. San-J’s Tamari Soy Sauce is brewed from 100% soy and no wheat, which imparts a far richer, more complex flavor than plain old soy sauce. 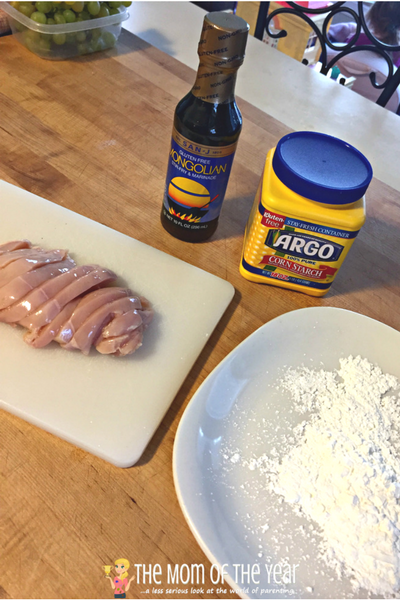 Add in other wholesome ingredients like garlic and ginger puree, arrowroot, and rice vinegar, and you have a secret weapon for those hectic nights! Regular soy sauce is typically brewed with wheat which makes it a huge no-no for those eating gluten free. 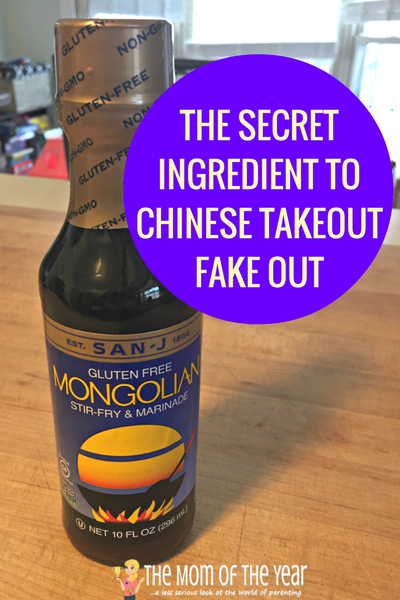 San-J’s Mongolian Sauce is created with their Tamari Soy Sauce, making it perfectly safe and delicious. Add in some brown rice and a steamed vegetable for a healthy and lightning-fast meal solution for those crazy days. Heat 2 tbs of oil in a wok (or similar deep pan) over medium-high heat. 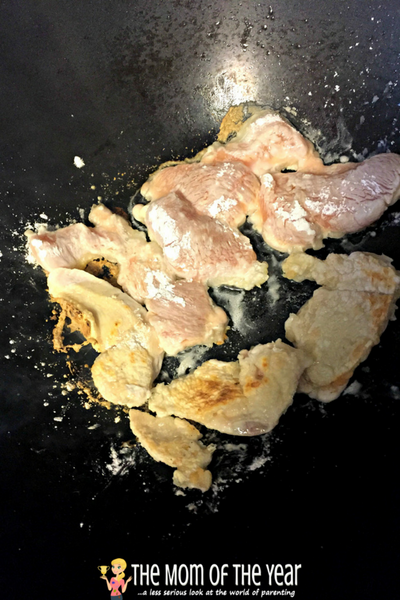 Dredge chicken pieces in corn starch and add to pan, trying not to crowd the pan. Cook for approximately 3 minutes on each side, or until mostly cooked through. 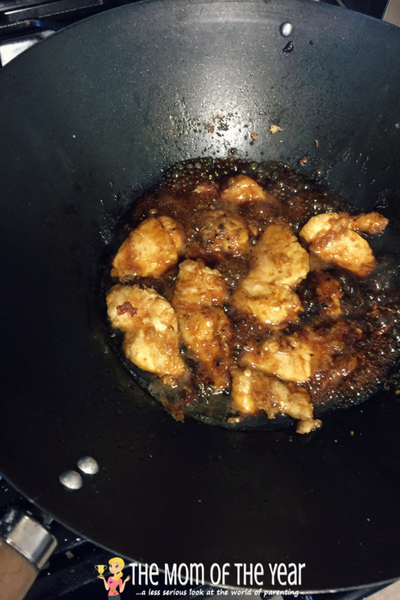 Add enough Mongolian Sauce to cover chicken, and toss. We prepared a quick cooking bulgur (like this one) but feel free to swap in a gluten free staple like brown rice or rice noodles. Any steamed veggie is a perfect fit for those looking to keep calories in check. We served steamed broccoli, but it would be fabulous with a blend of veggies, too. For a flavor boost, you can always drizzle some remaining sauce onto your veggies! 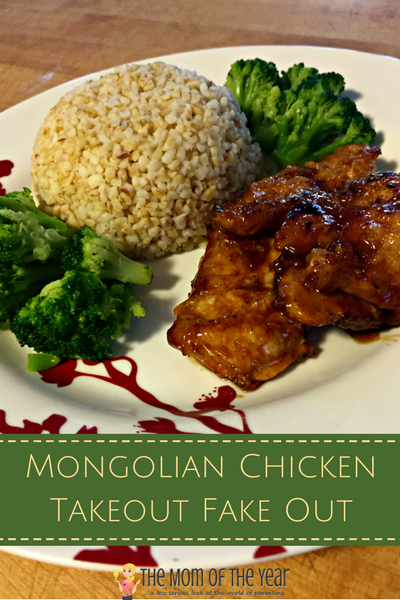 We had some happy diners–and a happy chef!–at our house with this San-J Mongolian Chicken recipe. This dinner totally hit the spot and came together in under a half hour–a win-win, and even faster than takeout! So, put those menus away, and get your Mongolian Chicken takeout fake out on! This looks tasty. I am The Queen of stir fry now – so much healthier and easier (most days, ha!) to make it at home instead of take out! We’ve always loved stir fry, but was never totally sold on the bottled sauces. I usually had to add some extras to make it a little tastier, but not this time! I could totally do this with tofu! Is it very spicy? Perfect! My kids love Chinese food but I don’t always love the takeout price tag. Exactly! And this totally fooled my 4 year old who is a total Chinese food snob. When she found out that I made it, her little eyes bugged out of her head. Total win!